Should we be thankful? And who deserves that thanks? And which potato are we talking about? First, a note on the importance of the potato: it provided more nutrients than other staple crops and helped rid the Old World of famine. This encouraged growth in the population of the continent, and – according to two Harvard economists *- this fed through to the cities with historic consequences. In the end, the cultivation of the potato contributed to Europe’s ascendancy and, by importation from Europe, to North America’s too. It’s a broad thesis, but reasons to be thankful? Oh yes. Second – which kind of potato? Hmmm. By the 1530s the sweet potato had been introduced to Spain from the Caribbean and was valued for its “venerous roots”: its aphrodisiac reputation made it a favourite in England, notably with Henry VIII. But that’s not the potato we’re looking for. Our true potato is the one known in the Andes as papas – its latin tag is Solanum tuberosum (conferred by Gaspard Bauhin in 1596) – and specifically two sub-species: tuberosum and andigena. The latter originated in the Andes regions of Colombia and Peru; the former is the potato commonly cultivated in Europe, but originating in Chile. These distinct origins – Chile v Peru/Colombia – leave us with a historical puzzle. Andigena was adapted to short tropical days and did not yield its crop in Europe until late September, when the day had shortened, and was commonly harvested in November. Even then it only grew in the more temperate areas of Ireland, Spain and Italy, so it wasn’t a practical food source. On the other hand tuberosum was suitable for harvesting in the longer days of a European summer. 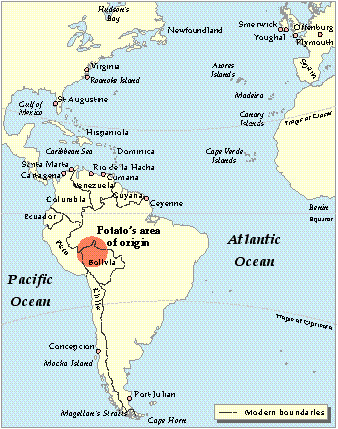 The puzzle is that the first voyage via the Straits of Magellan from Chile, source of the more suitable tuberosum, was in 1579, when the potato was already present in Europe. Therefore adigena must have come first. But when? No mention by Columbus or Cortez. The early botanist Clusius visited Spain in 1564 but made no mention either (although he was growing tuberosum by 1588). 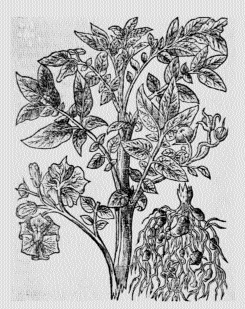 There is evidence of the plant in the Canary Islands in 1562, but it seems andigena was introduced to Europe through Spain no earlier than 1565. So we thank the Spanish. It’s probable they also introduced the potato to Ireland as well, given their frequent trade with the south-west of that country. Basque fishermen were well known for exploiting the fisheries of Newfoundland, using Ireland as a staging post during their voyages to dry their catches, and they did carry potatoes as ships’ stores. So andigena may have arrived in Ireland during those voyages, and also tuberosum after 1579. The Irish referred to the potato early on as an Spainneach geal – the white (or kind hearted) Spaniard – which gives substance to this speculation. So I suppose thanks is due not to the Spanish as such, but to ordinary Spanish traders. What of the English contribution? Walter Raleigh has enjoyed great credit, but that’s almost certainly based on a myth encouraged a century after his heyday. The myth seems to have arisen from his unhappy involvement with the Roanoke colony, and was probably compounded by a contemporary misunderstanding, accepted by John Gerard, that the potato originated in Virginia. The potato was entirely unknown in North America until the 17th century, and it wasn’t until the 1720s that it was cultivated there by settlers from Ulster. Sir Francis Drake is perhaps a better candidate for the introduction of the potato to Britain and Ireland. In fact there was a monument in Offenberg in Germany giving him the credit for the whole of Europe, citing the date of 1580 (curiously, it was destroyed by the Nazis). Certainly he had the opportunity to include the plant in his plunder of the New World, but the evidence only leads us so far, and beyond that it’s pure speculation. Another candidate is Thomas Cavendish, who explicitly referred to the potato during his circumnavigation of the globe in 1587, but there is no evidence he brought samples back to England. In sum, the evidence doesn’t really point to an introduction of the potato by any individual. What we’re left with is the inference that the crop was gradually spread through the ordinary process of trade. Not a bad conclusion. *Nathan Nunn and Nancy Qian, The potato’s contribution to population and urbanization: evidence from a historical experiment, Quarterly Journal of Economics (2011) 126 (2): 593-650. Also recommended – engaging article from the Smithsonian Institute: How the Potato Changed the World.